Hope Sewing is Genetic: First quilt, finished!!! 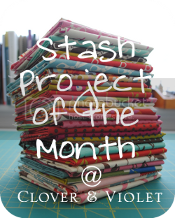 Edited to Add Clover and Violet's Stash Project link-up! Somehow, I managed to make my first quilt finish ever almost completely from my stash! I started sewing, simple things like bags and little girl skirts for my best friend, before I started actually quilting. I love picking up remnants from Joann's, and I'll definitely admit to having purchased a few collections of random fat quarters on eBay. My first finished quilt, and it isn't even for me! It's just a jelly roll race quilt - read more about them here - but I'm in love with the format and have one halfway done and another started right now. I wasn't sure how much to make for this particular quilt, so I just kind of kept going, so I have a second top with these fabrics finished already, for whomever has a baby girl next. This particular one, which is already wrapped up and ready to go, is for one of the managers at work, who's girlfriend is due to have their baby girl (his first little one!) pretty much any day now. It's a mix of regular quilting cottons and flannels, and the back is half flannel, half fleece. I didn't label it, even though I know I'm supposed to - but I did make sure to wash/dry it before tying it up, using Shout's Color Catcher sheets like someone's blog (sorry!) had suggested. Fantastic First Quilt! You do need to make one next for you! I made my first quilt 30 years ago and just posted about it recently! Love your quilt! Thanks for sharing! Wait--this is your first?? Well congrats!! I've been seeing these race quilts around and they're a lot of fun. Lucky baby. I just read somewhere about the color catcher as well--I've always been too afraid to wash my quilts because of bleeding...so now I feel better about doing so.